Using SCS Sketch 287 for inspiration and the wonderful Pear image from Marks Finest Papers, here's a cute "just because" card. The wonderful collection of papers is from October Afternoon, I used the Ruby pattern to paper piece the flowers on the pear, and added just a touch of Spica pen to the flower center. The image is colored using Staedtler Makers and the Marker Watercoloring Technique. Be sure to stop back tomorrow for this weeks Play Date Cafe Challenge - the Design Team put a fun spin on this weeks challenge! Your card is delightful! Love the pattern paper for flowers on the pear! 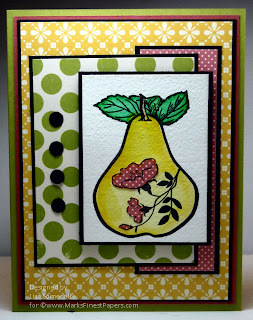 Wow this turned out just beautiful, luv the pp on the pear, cute stamp! Lisa I love this, I love the image and paper combo. I always anticipate your next blog post because I love to see your techniques. great use of the patterned paper the colors are perfect for it! Love the paper piecing! Great card! Love the pear with the flower overlay. Great design and love the coloring!